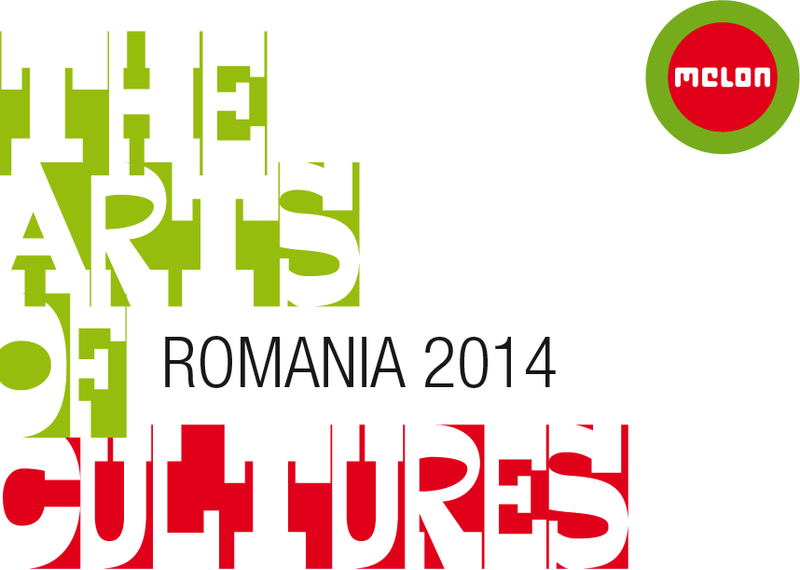 THE ARTS OF CULTURES by Melon – 2nd ACT. 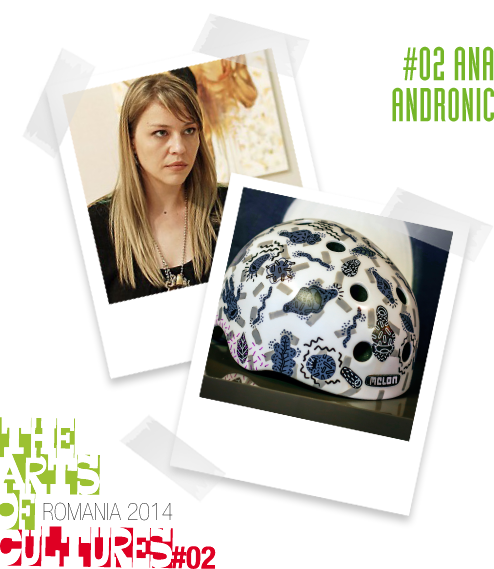 Art has always promoted an intercultural dialogue, and an everyday object like a bicycle helmet is an abstract but attractive medium for artists. There is nearly no medium that has a higher exposed visibility like a helmet on a head, a great stage for arts and messages. 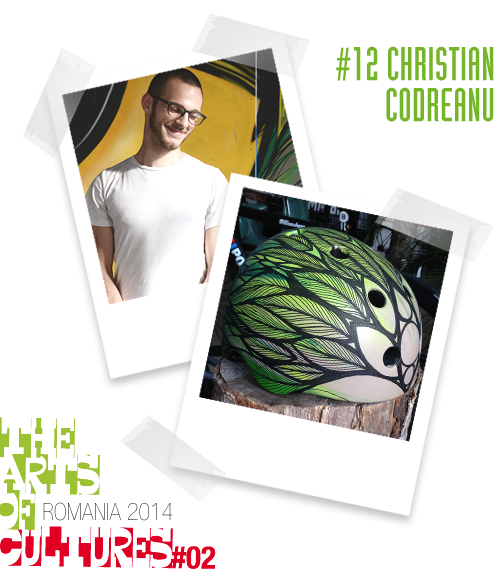 In 2013 we presented the “The Arts of Cultures by Melon” program at the Eurobike for the first time. 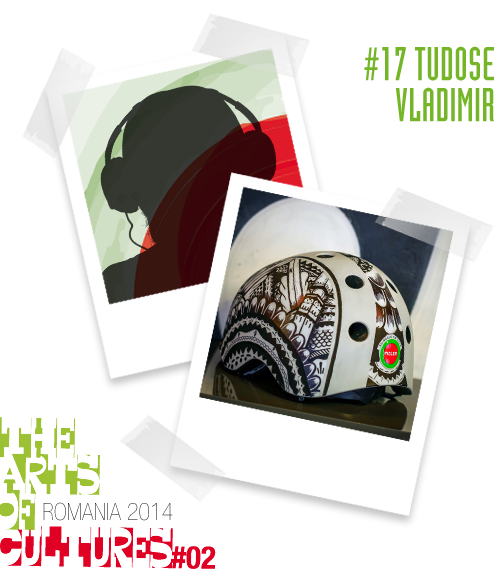 In cooperation with the Hungarian Partizan Art Studios and Gallery young Hungarian artists had painted 24 Melon® Urban Active Helmets. 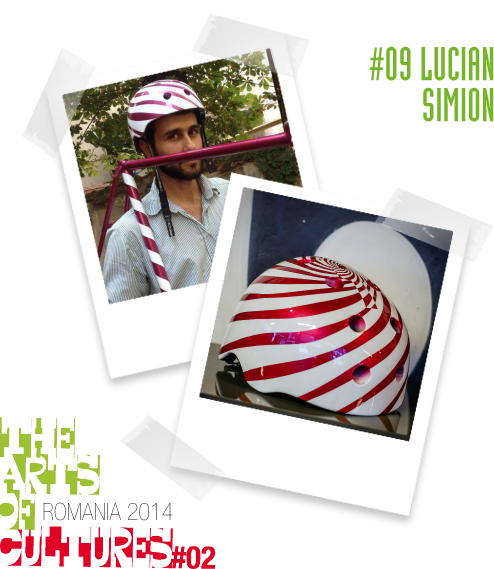 So, the everyday object helmet turned into a stage for annual updated cultural messages. 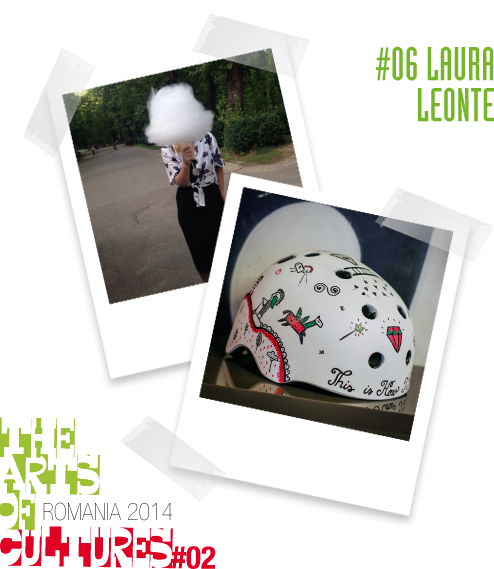 This year Romania is partner of our “The Arts of Cultures by Melon” and we expect again creatively designed helmets, bringing to expression that the brain is our most important organ. Every country has it’s own culture carrying in their brains, which we like to respect with our open dialogue between Melon as a brand and the currently 35 different cultures, where Melon helmets are available already after only 12 month. 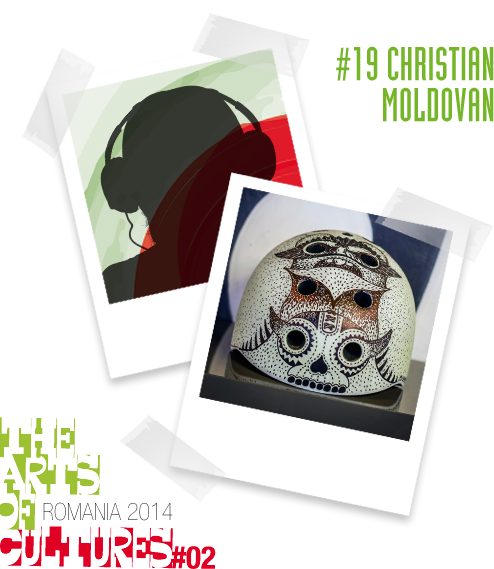 Arts as the international language will show us the fascinating different profiles and styles of each country. This message is for all designers and creative brains, to be a part of it. Contact us for details, if you like to be a supporter or artist to represent the design and mentality of your country. We are happy to welcome you! In the following days we will present you each day one design of our romanian Melon Tree, full of beautiful, awesome, fantastic, marvellous, passionate artful originals on original Melon helmets. We all were overwhelmed again. A big THX to all artists from Romania and Bicicletele Pegas, for their artist management & support! Graduate of UAUIM(University of Architecture and Urbanism “Ion Mincu”, Bucharest), Design section, 2002-2007. 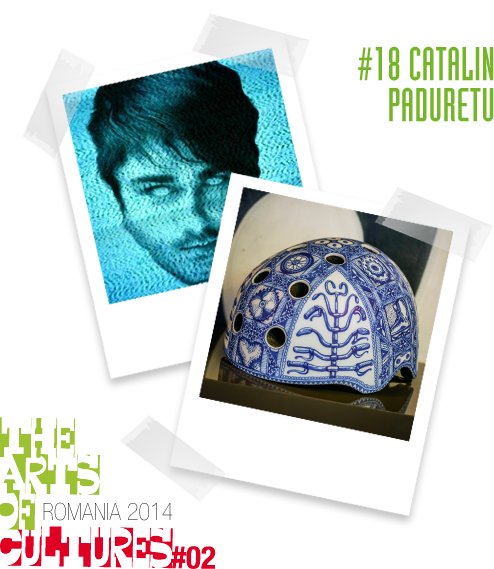 Passions: drawing, music, snowboarding, traveling. Concept: An ossuary homage to the extreme sports. The dynamism, the adrenaline and the aggression flank the sides as prehistoric predators. In the middle, the victims of accidents create a continuous series of skulls. Cristina is a romanian tattoo artist and loves reduced drawings and graphics with lines and dots to create patterns. “The fly” was inspired by a saying in Romania. Born in Bucharest, Dan Miron started drawing and painting in early childhood and stopped never since. Hours and hours of interpretation of nature, family, friends, pets, fantasy from a world of possibilities, stories for children, games and toys that interact with that boy he was and the man that he became. Laura is a copywriter with 0 art classes. That doesn’t stop her from drawing. She has been running a small online community of compulsive drawers like herself for the past 3 years - compulsivedrawer.com. This year she curated an Universal Coloring Book. 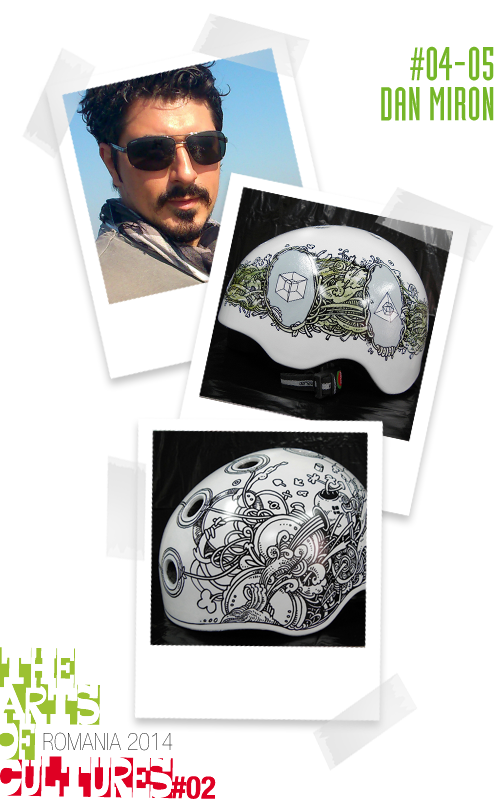 Helmet Description: The coolest thig about doodling is that you don’t have to think about it. It’s just a bunch of silly stuff. Elis is an Romanian illustrator always in search of a new medium of communicating the unconscious poetry. 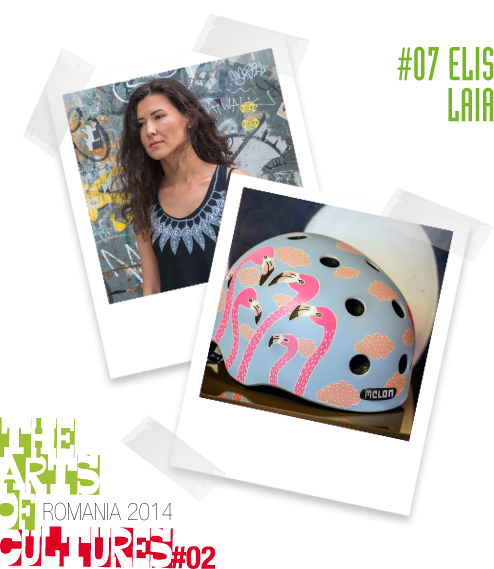 Flamingo Helmet represents two feelings that perfectly complete the experience of riding a bike: the feeling of serenity you get from it and the safety that comes from keeping your head above the danger, among the clouds. Graduate of UAUIM(University of Architecture and Urbanism “Ion Mincu”, Bucharest), 2003-2011. 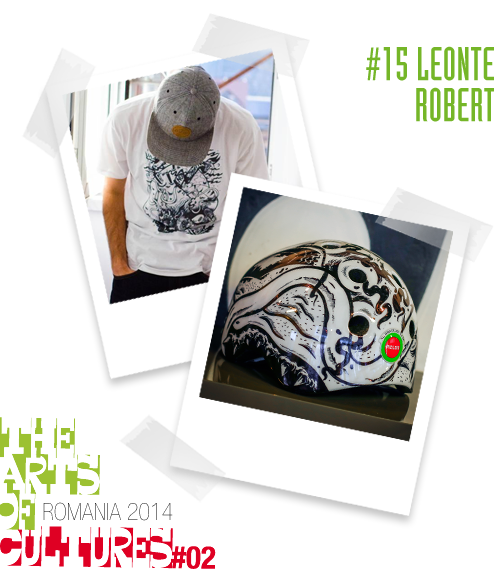 Passions: street art, drawing, design, skateboard, illustrations. Concept: Represents the chaos of Bucarest traffic and livin style. 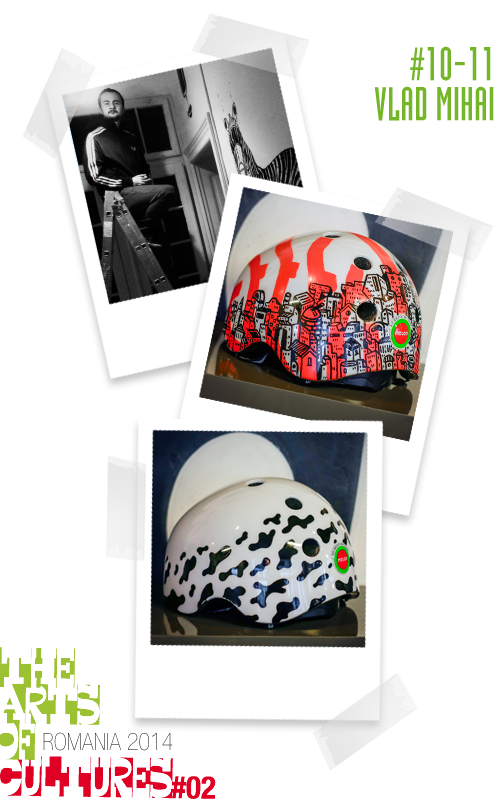 He is the founder of BițaColor, the first bicycle painting shop in Bucharest, Romania, the place where you can personalize you bike. 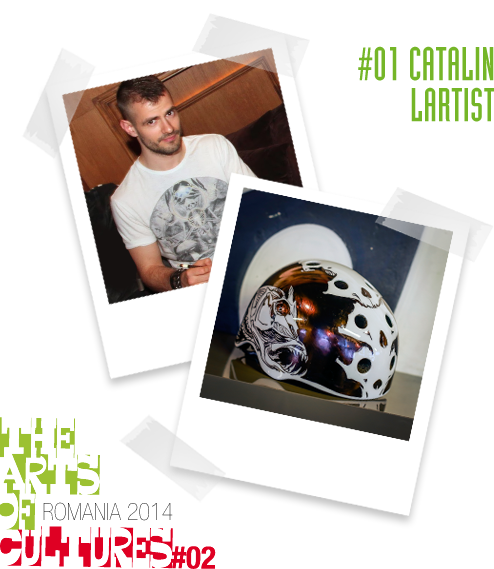 Young illustrator and art director with a background in advertising. The design is inspired by tribal war face paintings, so it’s like a totem giving you power to rise above and conquer the city. The cyclist is often pushed away by the traffic or worse, ignored. The camouflage design paradoxically signalises this problem. It also looks like a cow print; who doesn’t like cows? As a University of Arts Bucharest graduate, Pass continues to further and deepen the exploration of the connection between academics and real life. Enthusiastic about Romania’s potential, Pass attempts towards an honest approach in the exploration of organic materials, producing objects that have both artistic and ecological value, resonating with their surrounding natural environment as well as with the daily needs of the art consumer. The adopted style is a three-dimensional decorative one that also makes proof of contrast and contradiction meant to create a bridge between urban life and natural spaces. 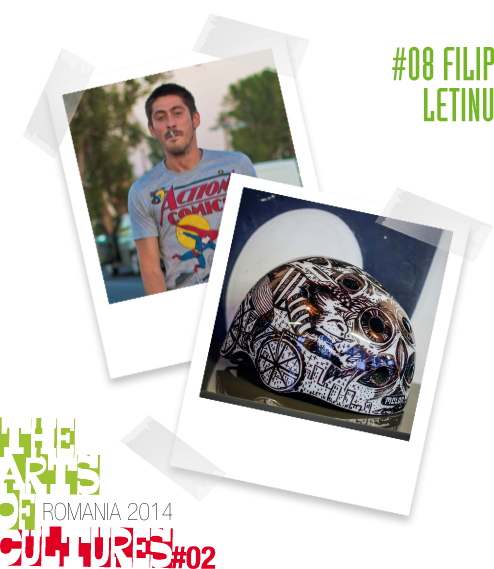 Thus, since his beginnings in the early 2000s, he prefers engaging in graffiti and street art projects that bring forward real societal struggles, that provide practical answers about the available artistic intervention options of artists in the public space. 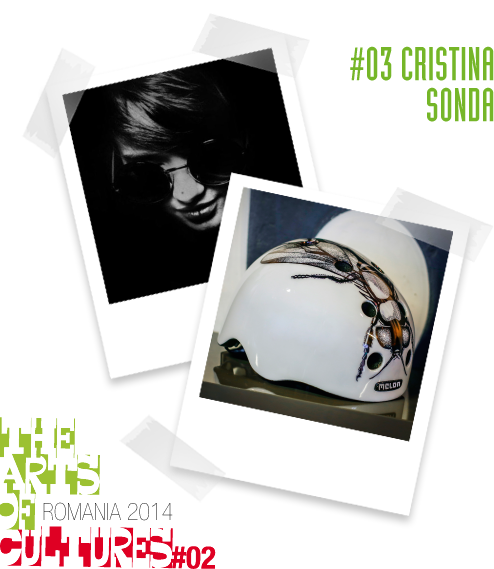 The frontal decorative feather element of the helmet transgresses into rough geometrical forms at the back, making a reference to the bird-like independence experienced by Pass as a biker, creating yet again a bridge between the natural, the organic and the systematization of the sharp forms and clearly defined norms of urban life. Colo is active in advertising for a long period of time, being a passionate portrait painter. Portraiture chosen captures the behavior of character detail that is often devoted to the artist and often ironic about promoting the image superficiality of such individuals. My name is Robert Leonte, a.k.a rO, after i finished the art school in my hometown Piatra Neamț, i moved to Bucharest where I started the art university, and got a degree in graphic design, while i was doing this i got myself addicted with the spray can, since then i love to play with ink, paint, vectors, calligraphy, digital photography, colours, shapes, life. 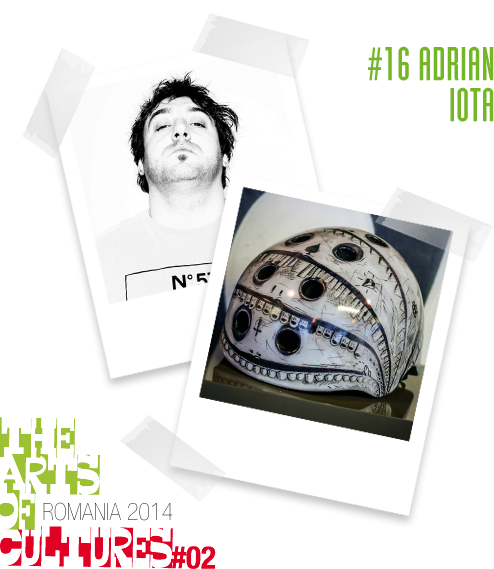 Helmet description: I chose to transform my helmet into a piece entitled “Beast Mode”. My vision of the project is defined primarily by dynamism, combining extreme sports and animal nature with an edge of street art. I decided to apply a variety of drawing techniques, such as hatching (Staedtler 0.2 Pigment Liner) and stippling (Faber-Castell Multimark 1525 Marker), in order to emphasize the helmet by manipulating the white space. I truly hope you will enjoy my contribution to the project and that “Beast Mode” will bring a smile to the rider’s face. There’s a clear reason for not reading too much text here, and that is because AGI prefers to keep his mouth shut and do stuff. However, when he’s got something to say, he sits down and draws a little monster. The little monsters become alive and speak out instead of AGI. And when he’s got something to do, if it’s not a monster, then it’s a creative brief, because AGI uses his other time to build stuff as a Senior Art Director at Publicis, an advertising agency that understands the need humans have for little monsters. I’m Catalin Paduretu, a Bucharest based advertising Art Director and Graphic Design graduate. Being haunted at night in any shape or form by illustration, typography and photography, I’m looking to find “peace and quiet” in a late bike ride.